Milk isn’t just for strong bones. In fact, sporting a milk mustache may be the best way to build muscle and blast fat, says new Canadian research. The all-female study group was split into three: a high-protein/high-dairy group, an adequate-protein/medium-dairy group, and an adequate-protein/low-dairy group. After 16 weeks, the high-protein/high-dairy group was the only group to gain muscle (1.5 pounds on average) and it also lost the most fat (8.8 pounds). The others lost muscle and not as much fat. Researchers believe these results would apply to men, too. The key is casein and whey, two proteins found in milk. “Since casein is digested slowly and whey is digested quickly, the protein is delivered to the muscles in two phases,” says study author Andrea Josse, Ph.D. student at McMaster University in Canada. Whey starts to build muscle quickly and casein continues the building process after the whey is already digested. “The amino acids reach the muscles faster, but also last longer, in comparison to other sources of protein,” she says. Though meat and eggs are great options, they’re digested more slowly and are more like casein. The absorption properties in dairy are best for muscle building because of the quick/slow combo. Also, calcium has also been shown to promote fat loss, she says. 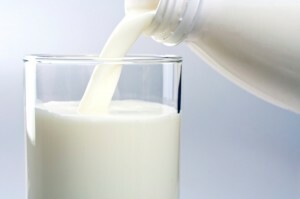 If you’re trying to lose fat and gain muscle, drink 1 to 2 cups of milk after a workout, when your muscles are primed for growth, says Josse. Within an hour after your workout is best. Tags: Drink to Your Abs!